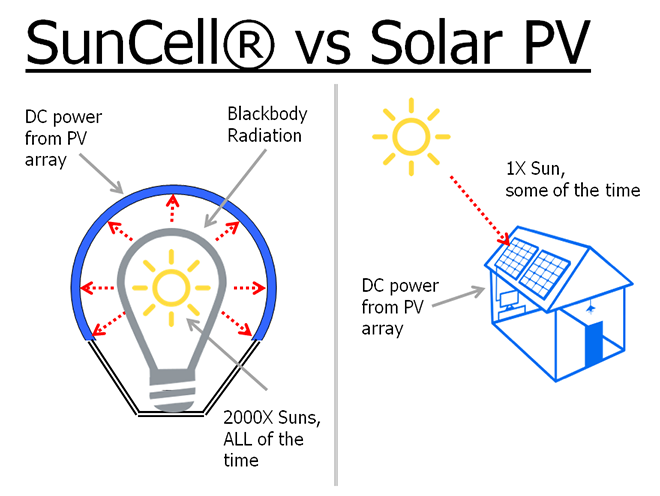 The SunCell® was invented and engineered to harness the clean energy source from the reaction of the hydrogen atoms of water molecules to form a non-polluting product, lower-energy state hydrogen called “Hydrino” that is the dark matter of the universe wherein the energy release of H2O to Hydrino and oxygen is 100 times that of an equivalent amount of high-octane gasoline at an unprecedented high power density. The compact power is manifest as thousands of Sun equivalents that can be directly converted to electrical output using commercial concentrator photovoltaic cells or magnetohydrodynamic conversion. Applications and markets for the SunCell® extend across the global power spectrum, including thermal, stationary electrical power, motive, motive to stationary, and defense. 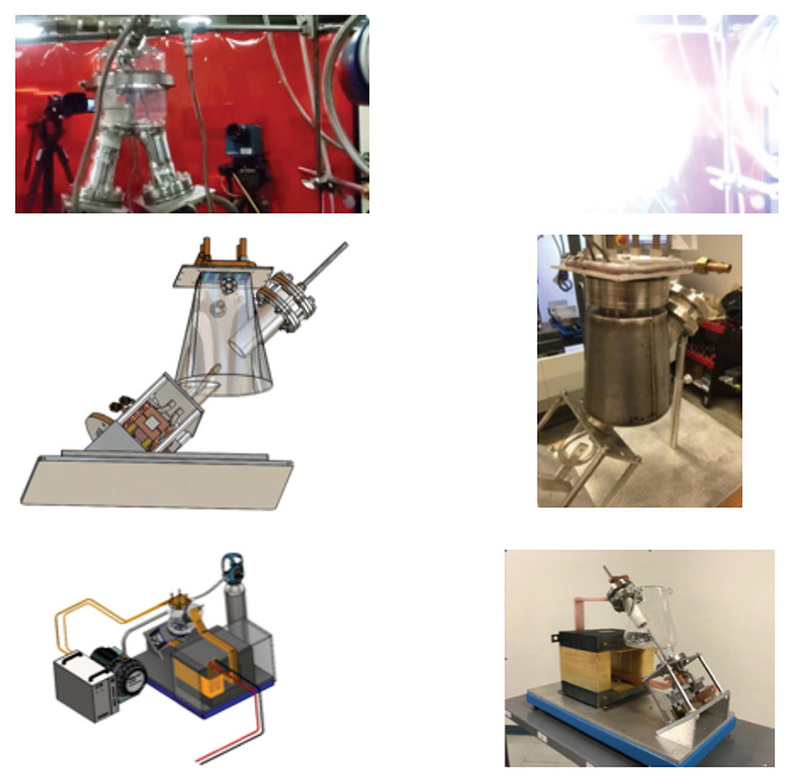 The SunCell® comprises seven fundamental low-maintenance commercially available systems, some having no moving parts and capable of operating for a decade or more: (i) a sealed reaction cell chamber; (ii) a start-up heater to first melt silver or gallium; (iii) a gas injector to inject water or hydrogen and trace oxygen derived from water wherein the trace oxygen reacts with trace amounts of the hydrogen inventory to form the hydrino catalyst, and the majority of the hydrogen inventory serves as a reactant to form hydrino; (iv) a molten metal injection system comprising at least one electromagnetic pump to inject molten silver or gallium; (v) an ignition system to produce a low-voltage, high current flow across a pair of electrodes which comprise at least one molten metal injector and its injected molten metal stream and a counter electrode injector and its steam or a molten metal pool with a bus bar wherein the at least one stream electrically connects the electrodes to form a brilliant light-emitting plasma; (vi) a power converter: (a) a light to electricity converter comprising a window to transmit light from the reaction cell chamber and a dense receiver array of concentrator photovoltaic (PV) cells that receives the light having an intensity of up to one thousand Suns or (b) a magnetohydrodynamic (MHD) converter with an inlet converging diverging nozzle to form a supersonic plasma jet wherein the plasma kinetic energy is converted into electricity; and (vii) a fuel recovery and a thermal management system that causes the molten metal to return to the injection system following ignition. Click on this image for videos of operating SunCells®. Click on this image to learn more about concentrator PV conversion. 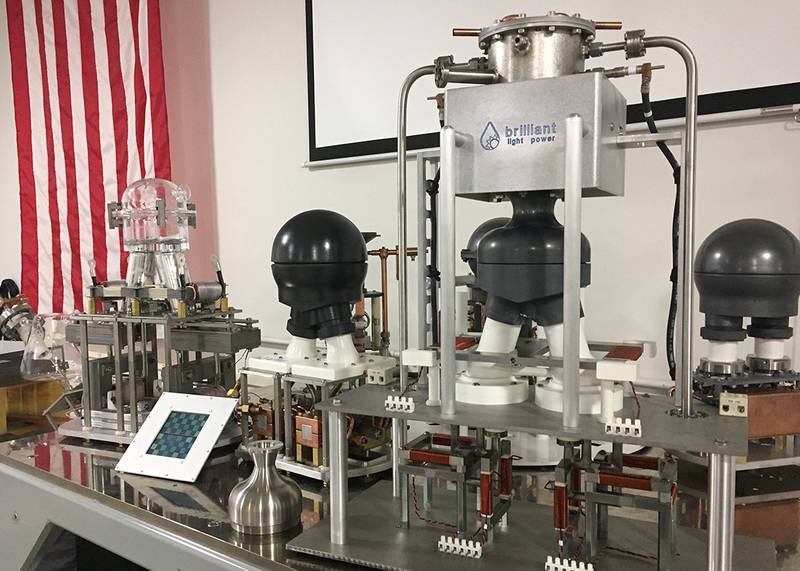 A quartz SunCell® having induction pumps and ignition systems and an MHD converter that exploits a unique proprietary thermodynamic cycle was recently engineered to maintain the hydrino reaction and harness its power as electricity. This SunCell® power system comprises (i) a reaction cell chamber; (ii) reactants comprising nascent H2O catalyst, a source of atomic hydrogen, and a molten silver metal; (iii) a molten metal injection system comprising two molten silver reservoirs each comprising an injection tube and an induction electromagnetic pump comprising a source of alternating magnetic field through a shorted loop of molten silver that induces an alternating current in the metal and a source of in-phase alternating vector-crossed magnetic field; (iv) an induction ignition system comprising a source of electrical power to supply high-current electrical energy sufficient to cause the reactants to react to form plasma; and (v) a magnetohydrodynamic (MHD) power converter. The induction ignition system comprises a source of alternating magnetic field through a shorted loop of molten silver that generates an alternating current in the metal that comprises the ignition current. The source of alternating magnetic field is a primary transformer winding comprising a transformer electromagnet and a transformer magnetic yoke, and the silver serves as a secondary transformer winding such as a single turn shorted winding that encloses the primary transformer winding and comprises as an induction current loop. The reservoirs further comprise a molten metal cross connecting channel that connects the two reservoirs such that the current loop encloses the transformer yoke wherein the induction current loop comprises the current generated in molten silver contained in the reservoirs, the cross connecting channel, the silver in the injector tubes, and the injected streams of molten silver that intersect to complete the induction current loop. 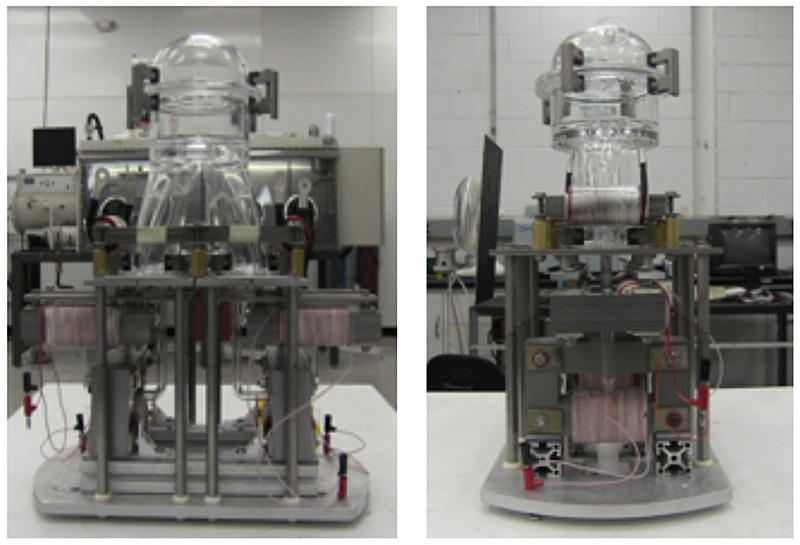 The powerful plasma formed by the ignition system is converted to electricity by the MHD power converter. 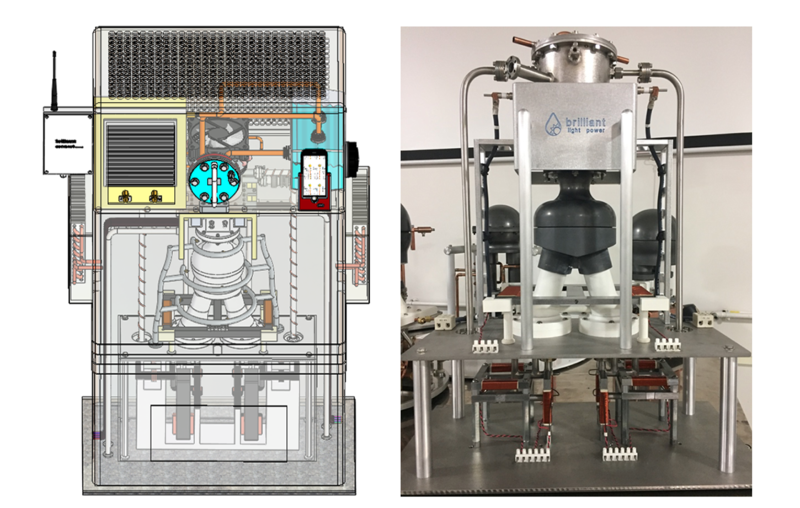 The MHD power converter comprises a converging-diverging nozzle connected to the reaction cell chamber, a magnetohydrodynamic channel, electrodes, magnets, a metal collection system, a metal recirculation system, a heat exchanger, and optionally a gas recirculation system. 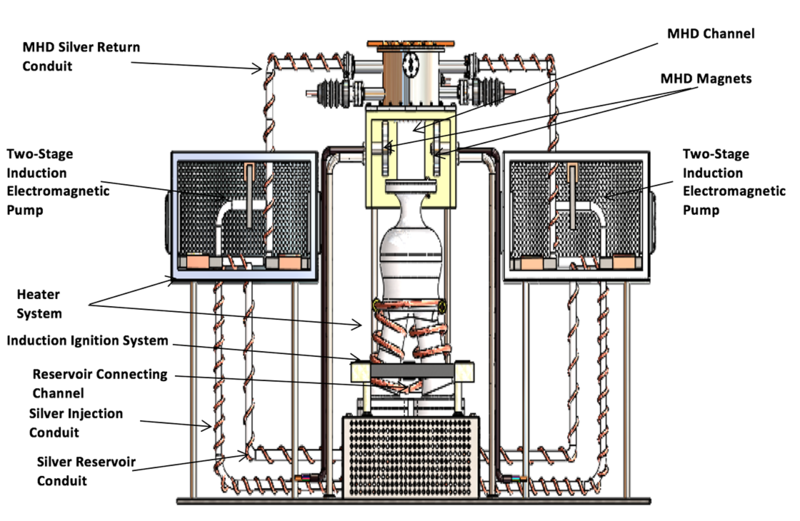 The typical MHD method is to expand a high-pressure gas seeded with ions through a nozzle to create high-speed flow through the crossed magnetic field with a set of electrodes crossed with respect to the deflecting field to receive the deflected ions and generates an DC voltage output. A super-hot plasma is created, ionizing the atoms of the fuel mixture, source of electrically conductive fluid (already in place from SunCell®). The magnetic field deflects positive and negative charges in different directions. Collecting plates-electrodes, a conductor through which electricity enters for the charges providing a DC voltage out. Prototype MHD generators have demonstrated some large-scale commercial feasibility. Failure modes of very low conductivity and corrosion of ion-seeded combustion gas eliminated by SunCell®-MHD. Direct power extraction (DPE), emerging technology to directly convert thermal & kinetic power to electrical power. BlackLight Process:A novel chemical process invented by Dr. Mills causing the latent energy stored in the hydrogen atom to be released as a new primary energy source. Hydrino: Hydrinos are a new form of hydrogen theoretically predicted by Dr. Mills and produced and characterized by BrLP. Hydrinos are produced during the BlackLight Process as energy is released from the hydrogen atom as the electron transitions to a lower-energy state resulting in a smaller radius hydrogen atom. Brilliant Light has solved the theory, confirmed Hydrino reaction products by many analytical techniques, and identified Hydrino as the pervasive dark matter of the universe. SunCell®: Each SunCell® comprises a reaction cell with two electrodes that support the injection of highly electrically conductive, recycled inert molten silver or gallium metal. The reaction cell is supplied with Hydrino reactants such as H2O that serves as a source of atomic hydrogen, H, and nascent H2O, the catalyst to form Hydrinos from the H. A low-voltage, very high current (about one hundred times that of household currents) ignites the reaction to form hydrinos and causes a burst of brilliant light-emitting plasma power of up to millions of watts that can be directly converted to electricity using proven light to electric power concentrator photovoltaic conversion technology. Alternatively, the plasma power of the Hydrino reaction may also be converted directly to electricity by a magnetohydrodynamic converter. Photovoltaic or Solar Cell: Each cell comprises a flat panel of a semiconductor material that exhibits the photovoltaic effect, a method of generating electrical power by converting radiation such as solar radiation into direct current electricity. Light absorption in the semiconductor material creates energized charge carriers of opposite polarity that are collected at corresponding negative and positive electrode contacts on opposite sides of the flat panel to create a voltage.